One of our recent commissioned artwork projects was to create appreciation artwork for Collette. These pieces are awarded to exiting board of directors and employees that have worked there 20 years or more. It is no wonder that with this kind of investment into their people Collette was recognized by Providence Business News as one of the best places to work in Rhode Island in 2013. By planning and presenting this award, Collette shows that they deeply value and honor their people that have encouraged the success and prosperity of the company, expressing a world of gratitude and appreciation. Ahlers Designs custom designed this award, crafted from reclaimed, and recycled materials. 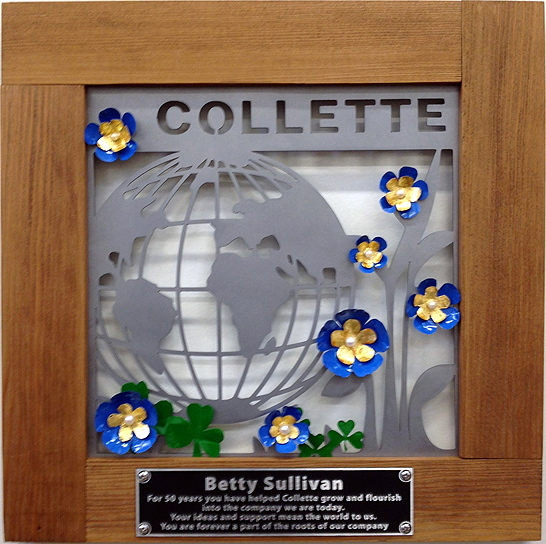 This piece illustrates their logo colors of blue and green, highlighting one of Collette’s key destinations – Ireland. The blue is represented with blue flax flowers and the green with Shamrocks; both plants readily distinguished as Irish symbols. 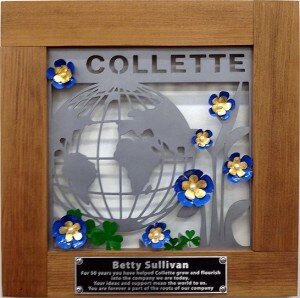 The flowers & shamrocks are made of recycled cans from Rhode Island’s local Narragansett Brewery. From the back of the artwork you can see the green shamrocks are Narragansett Bock Lager cans, and blue flax flowers are Narragansett Cream Ale. Ahlers Designs creates singular works of appreciation art to commemorate milestone events in people’s lives. We make one-of-a-kind works of art that will be admired and treasured for generations. My passion is making art, creating joy and empowering people. Find out about more exciting things we are up to by liking us on Facebook or follow us on twitter @GailAhlers.